On 9 July 2010 in Honolulu, leaders of the Dominantly Inherited Alzheimer Network gathered to brief each other and—at the end of a long day cooped up in conference while everyone else was playing at Waikiki Beach—to present to some 30 pharmaceutical industry scientists the first cut of baseline data from this ongoing biomarker study. Results are preliminary and will evolve as more people enroll; however, they provided a tantalizing snapshot of how the science of DIAN is shaping up. John Morris, Randy Bateman, Mark Mintun, and Anne Fagan presented results on behalf of DIAN’s coordinating site at Washington University School of Medicine in St. Louis, Missouri. CSF and imaging data behaved largely as expected, and plasma also yielded an intriguing signal. Read on for details. The scientists cut off data on 73 participants on June 15 for analysis. As of this day, some two-thirds had completed the lumbar puncture, PIB-PET, and FDG-PET imaging, while nearly everyone had an MRI and the clinical assessments done. As the international sites ramp up enrollment, they vary in how many of their participants complete all assessments, and investigators are currently working on bringing this rate up near 100 percent at all sites. The WashU site achieves this goal, and Morris emphasized that it is possible for all others to do so as well. In Honolulu, a discussion of the reasons for gaps that exist to date led to two take-home messages. First, lumbar puncture—for which DIAN-wide acceptance lies currently at 65.8 percent—requires both education to counter misconceptions about its risks and adherence to best practices to minimize those risks. Second, where at all possible, scheduling all procedures into a single three- or four-day extended visit tends to work better than calling participants in repeatedly for individual procedures. Morris urged all investigators to take plenty of time to explain the purpose and importance of the CSF results to research volunteers. This is necessary, the scientists agreed, to enable analysis of DIAN’s data at the statistical power they originally envisioned. Martin Farlow from DIAN’s Indiana School of Medicine site urged all investigators to ensure that volunteers are well hydrated before the procedure, as that reduces the risk for headache, a rare side effect of lumbar puncture. Who are the study participants? Of the 73, about a quarter were symptomatic, which this study defines as CDR 0.5 in one or more of its categories. Many of them are men in their late forties. The asymptomatic participants’ ages range from the twenties to the fifties, and two thirds of them are women—a preponderance frequently seen in AD research studies. As expected, half of the asymptomatic volunteers carry an eFAD mutation; curiously, a few of the symptomatic people appear not to. The scientists are investigating now whether these people are false positives—i.e., they have mild clinical symptoms that do not represent the actual start of a neurodegenerative disease—or whether a mistake in their genetic test will turn up and they eventually prove to have inherited the family’s AD mutation, after all. A majority of cognitively normal participants to date are quite far off from their parents’ age of onset. This reflects perhaps a new, young generation that is more proactive, said a family representative who asked that her name be withheld. However, the study needs more people who are closer to the expected age of symptom onset, both to observe the full dynamic range of biomarker changes and to start planning therapeutic trials, Bateman said. What has DIAN learned about the volunteers? The numbers here get smaller as sample mailing and data analysis are actively ongoing, but in brief, the cerebrospinal fluid assessments trend along familiar lines. Among 27 volunteers, the mutation carriers had significantly lower CSF Aβ42 levels as measured by the Innotest ELISA. The same measurement done with an xMAP platform yielded a smaller signal going in the same direction, said Fagan. (For details on relative CSF test performance, see CSF quality control series). As expected, CSF Aβ40 levels were the same between carriers and non-carriers, but the Aβ42/40 ratio was markedly different, driven by the drop in Aβ42. CSF Aβ42 was low in people near their estimated age at onset, but tended to be as high as in non-carriers in those who were 15 years or more younger. “These are preliminary but highly informative data,” said Fagan. Also in the CSF, tau results shape up to reveal some trends. As measured with xMAP assays, carriers appear to have higher tau levels than do non-carriers; this is also true for tau phosphorylated at position 181. Starting some 15 to 20 years prior to age at onset, levels rise, and rise further as people become symptomatic. If this finding holds up, it would imply that drug trials could be offered more easily to eFAD families who are not part of DIAN, for example, families in Sweden and other countries. In this vein, researchers spoke about creating an international registry modeled on DIAN, into which families who are not participating in DIAN itself could enroll with a fraction of that study’s data and in this way become eligible for therapeutic trials that grow out of DIAN. Initial amyloid imaging with PIB-PET showed that starting 15 to 10 years prior to age at onset, carriers retain more of this amyloid marker than do non-carriers. This is particularly true in the precuneus, an early place of deposition in LOAD, and in the caudate part of the striatum (a brain region not traditionally associated with AD but one where fibrillar amyloid deposits early on in autosomal-dominant AD). The DIAN scientists presented one PIB slide (see below) from the Familial Adult Children Study, a precursor to DIAN. 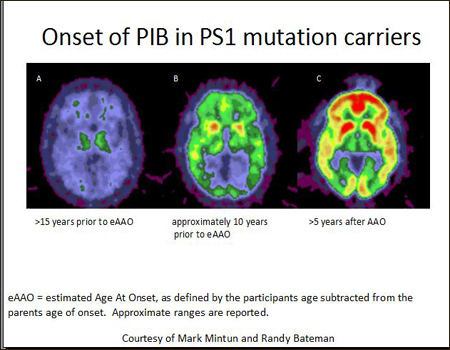 It shows, on the left, a cool blue PIB-negative brain of a mutation carrier approximately 15 years prior to the parent’s age at onset; in the middle a green, mostly negative brain of someone 10 years prior to onset who had small red spots in the caudate; and on the right the flaming yellow-red amyloid- laden brain of a demented person five years after onset. Bill Klunk of the University of Pittsburgh Medical School noted in a brief review of six-year-old ongoing PIB studies with some 20 eFAD family members that to find APP or presenilin mutation carriers who are PIB-negative, one may have to image people in their twenties. With regard to clinical observation, Bateman presented some early analyses of the concept of estimated age at onset (AAO). This is thought to be slippery because scientists generally estimate this age according to when the affected parent got ill. But in some families, siblings recall different ages for that, and typically people were diagnosed at a later stage one generation ago than they are today. Even so, plotting the age of each DIAN participant against that person’s individual AAO (i.e., current age minus parents’ age at onset) showed that, so far, all presymptomatic carriers are younger than this estimated age at onset, and most symptomatic carriers are older. Likewise, participants’ MMSE starts dropping one to five years before their AAO, and their CDR moves up at that time from the perfect score of 0. This suggests that this estimated AAO measure reflects a symptomatic turning point and can be used for designing therapeutic trials, Bateman said. The MMSE is a crude tool to assess cognitive impairment in middle-aged people; the more detailed psychometric tests that are part of the DIAN clinical battery have not been analyzed in this way yet. “These results are very preliminary. The numbers will change after quality control and as the samples grow. But right now, things are trending in the right direction—perhaps we are beginning to see these signals,” said Morris. With the exception of the caudate location for early amyloid deposition and the plasma Aβ result, all findings to date are similar to what is known about late-onset AD, reinforcing DIAN’s hypothesis that the rare forms of AD model the common forms, Bateman said. So what are pharma and biotech companies to do with this brand-new data, shared openly with the drug development community? A movement toward therapeutic trials is in place. On 23 March 2010, DIAN scientists and representatives of the NIA, the ADCS, the API, and a regulatory adviser met in Geneva, Switzerland, with representatives of 11 pharma and biotech companies that are developing AD drugs. The charge of that day was to discuss the underlying science, potential biomarker trial designs, and ways in which a drug-based prevention effort could be pulled off collectively. At the time, pharma representatives endorsed the concept. They professed their interest to act now, but said they needed to be consulted confidentially, one-by-one, to discuss potential drugs. Since March, the DIAN scientists and their colleagues from API have held 12 such meetings with individual pharma companies, with one more to come next week. They are following up with confidentiality agreements and are working on trial design. However, trial design can only go so far without knowing what the drug will be. “We are at an impasse where we cannot define the possible designs further without knowing which drug we’ll use. We have provided the requisite scientific information,” said Bateman. As the next step, DIAN scientists will prepare a “nomination packet” and send it to the companies, which can then nominate a candidate drug, or drugs, for such trials. This need not yet be a binding commitment, said Bateman, but it does need to be a genuine effort on the part of pharma to advance the planning into a more concrete phase. Multiple treatments can be considered and evaluated initially in short biomarker studies that measure target engagement before any subsequent longer trials. These packets will arrive at the companies’ doorsteps in August, putting the ball squarely in their court.—Gabrielle Strobel. This is Part 2 of a two-part series. See also Part 1. Download PDF of the entire series. One can only applaud the courage and commitment of the investigators involved in this study. It is surely a wise move to follow people with dominant mutations who are clearly at risk for clinical AD, and the markers to be studied are probably the best available. But I'd still like to ask two questions: How sure are we that the accumulation of amyloid seen by scanning and the CSF levels of Aβ and tau that are being measured do indeed reflect the earliest pathogenic mechanisms that lead to symptomatic AD? Secondly, is this the best time to couple this study with a battery of untested experimental therapies? No one is more aware than I of the desperate need for effective treatments, and the pressure on the investigators to add them to the study must surely be suffocating. My concerns are these: Although the evidence linking amyloid Aβ to AD is overwhelming, we still don’t know how or when it becomes toxic, and, equally important, whether other factors, such as inflammation, oxidative damage, and vascular injury are just as critical to the development of clinical disease. Does this overwhelming focus on amyloid as the primary culprit divert attention and resources away from the study of these other factors? If we continue to ignore them, the best designed therapies for the control of amyloid may be rendered ineffective.